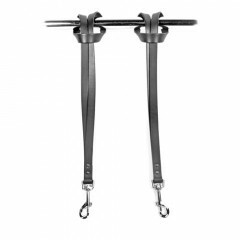 These tethers are constructed of a strong 3/4 inch black belting leather with a heavy duty nickel plated D snap clip. You simply loop the tether around any object, and you will quickly an easily have an instant attachment point for cuffs, collars and other restraints. Tether is made of 3/4 inch wide black belting leather.